I've had a few ideas floating around my head for awhile now, and so last week I decided to proceed with one of them. 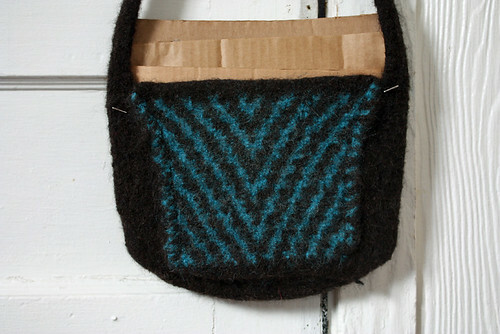 I knit most of my bags in the round (so they are all one piece) because it works and I like the look of the felted result not really having any seams. But I've been thinking about a lot of different things, and knitting in the round is limiting to a certain extent. There are some color work designs that I want to use but just haven't been able to figure out how to make them in the round. So I decided to do something with seams, i.e. make the base, front, back and side panels separately and seam them together at the end. Have I mentioned that I hate seaming? I really do. I don't know why and usually it ends up being less of a pain than expected. But I always dread doing it. So I planned the bag out in my head. (If I could sketch, this sort of thing might be a lot easier.) I made the base and then picked up the stitches on each side to do the panels so in the end, I only had the side seams to sew up. I've seen some felted bags with the seams on the outside and I thought it looked kind of cool so I decided to seam my bag on the outside. It makes for a chunky sort of edge. I could tell as I knit that things weren't really working out as planned. They were kind of working, but not entirely. But I decided to push forward so I could learn from my mistakes. 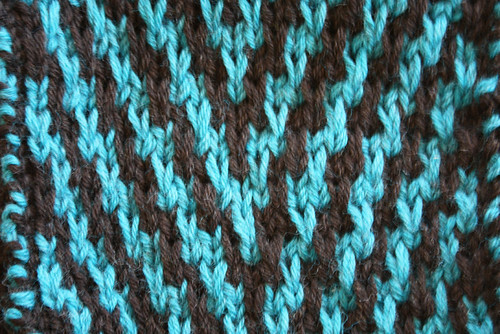 Once I got it all seamed and the strap knitted, I knew by looking at it that it wasn't going to work out. The color work design would probably be alright, but the construction of the bag was all wrong. I almost frogged it as to not waste the yarn. In the end, I decided that I would go ahead and felt it because one, felting is always surprising and it could end up working out and two, even if it did turn out to be a disaster, I could learn something useful from it. Maybe I could figure out how to make it work. I wasn't even really sure that this color work pattern would felt well. But I knew if it did, it would be pretty awesome. In the end, the bag did not work out. It hurts a little bit to lose the yarn, but really, it's okay. 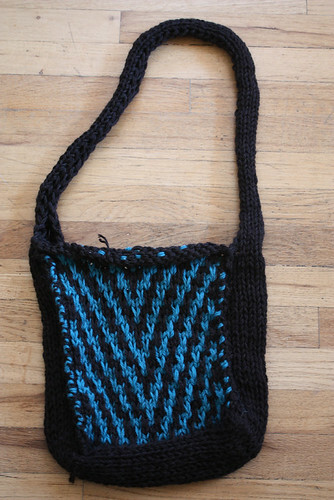 I know I need to figure out some other way to use this particular color work design on a purse. And I know that I don't like seams on the outside, at least not the way I did them here. I also learned that I still don't like seaming! I'll probably try it again at some point, but I think I will approach it differently. I also think if I had put two handles on this bag instead of a strap, it might have worked better. Live and learn, that's how it goes. On the list of things to make.